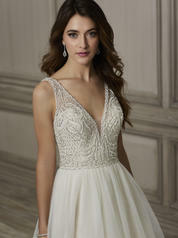 All over, hand beading, creates a work of art on this tulle gown. A combination of crystals and beads have been used to create flattering patterns on this modern, but classic style. A plunging front neckline has an illusion insert for added support and coverage while the back-neckline dips to the waist. This classic skirt has been made of layers of circle cut and lightly gathered tulle.